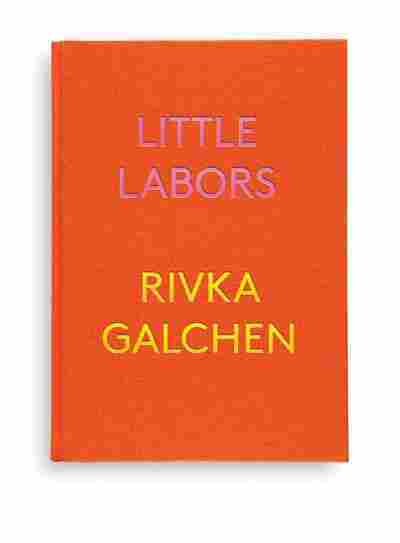 'Little Labors' Is No Small Feat Rivka Galchen's meditation on motherhood is wry, low-key and non-linear, inspired by the 11th-century Japanese classic The Pillow Book of Sei Shonagon — and the sleep-deprived brains of new parents. Little and minor are not the same, Rivka Galchen notes in her new book on motherhood. Little Labors is the length of my hand and width of my pinky, and many of the pages only have a few words on them. But in this slight and scattered book, Galchen lets her silences gestate. Chapters range from a sentence to a few pages. Wry, low-key, and nonlinear, they take their inspiration from The Pillow Book of Sei Shonagon, an artifact of Japan's 11th century Heian court that is, in Galchen's words, "not a novel and not a diary and not poems and not advice, but it has qualities of each, and it would have been understood at the time as a kind of miscellany, a familiar form." The entries are pebble-like: small, smooth, and satisfying in the palm for hard-to-identify reasons. One chapter from Galchen's miscellany, called "Other people's babies" reads, in its entirety: "Are often noted to not be of interest." When Galchen gave birth to her daughter (who she calls "the puma," until she can walk, when she becomes "the chicken"), "[t]he world seemed ludicrously, suspiciously, adverbially sodden with meaning. Which is to say that the puma made me again more like a writer (or at least a certain kind of writer) precisely as she was making me into someone who was, enduringly, not writing." Children transform those around them — in particular, Galchen describes the weird, silent, almost mystical power of children before they speak (in-fans, literally not speaking). She quotes a friend: "'Before they spoke, it seemed like they might be thinking anything. Then they learned language and it turned out they just had a list of wants and dissatisfactions.' She adds, "It's striking that in the canonical Gospels, we meet Jesus as a baby and as an adult, but as a child and teenager, he is unserviceable." Galchen's implicit proposition — that babies can be the subject of serious art, that we may coo and think simultaneously — feels surprising, even radical, in a world where motherhood and intellectualism are still placed instinctively at odds. The book is cyclical and sideways, structured in the loosely associative manner of actual thoughts rather than in logic or argument. I get the sense that it does not aim to please or appease — not because it is brash or defiant in any way but because it is quiet, queer, on the sidelines examining the grooved soles of its sneakers rather than running the race. It even, at times, features imperturbable and unapologetic flights from logic — for example, a theory that the sudden trendiness of orange baby items is a trend sparked by Guantanamo jumpsuits. In a typical passage, equal parts strange and striking, she writes: "[Babies] are the only incontestable accessors to power, or, at least, they are immeasurably more well-placed than their elder co-unequals. The way a baby, in a stroller, briefly resembles a fat potentate, for a moment unlovable, has something in it of the premonition. Even as to see a baby raise its chubby hand—to bow down before that random emperor can feel very right." More than one recent book about motherhood adopts this elliptical, koanlike structure (Maggie Nelson's The Argonauts, Sarah Manguso's Ongoingness) and I wonder if it comes back to something Galchen says about the way time changed for her after her baby was born: "But the paradox was that as my life had become a day of unprecedented length, a day that I was calculating to now be almost three thousand hours long (in doing the math I realized that since the puma's arrival I had not slept more than 2 1/2 hours in a row) my thoughts had become unprecedentedly interrupted, as if every three minutes I had fallen asleep, curtailing any thought, morphing it into dream, which, when I woke, was lost altogether." In other words, maybe having a baby reorients your sense of time, of spacing: no long chapters with healthy 8-hour chapter breaks but short cyclical snatches, sleepless brains at work. Galchen catches at the deep strangeness of these small foreign persons in our midst, their silent and shattering power. She recounts a Japanese myth about a foundling from another world who arrives with quantities of gold and is eventually reclaimed by her parents. "Suddenly the strange old myth seems to be just a straightforward and basically realistic tale about babies: their arrival feels supernatural, they seem to come from another world, life near them takes on a certain unaccountable richness, and they are certain, eventually, to leave you." Galchen's implicit proposition — that babies can be the subject of serious art, that we may coo and think simultaneously — feels surprising, even radical, in a world where motherhood and intellectualism are still placed instinctively at odds. It may be a little book, but it is not a small one.